In the middle of a painting session with Quinn yesterday afternoon (in which we painted heart-shaped pumpkins and talked about how to mix red and yellow to make orange), my oncologist's office called. As it happens every time I see their office name on my phone's screen, my heart leapt into my throat. Was something wrong with my blood work? I couldn't help wondering. It was something much more benign than that (pun intended). They've scheduled my next CT scan -- how can it possibly be that time again already? -- and wanted to pass along the details, to remind me of the rules even though the routine is painstakingly familiar at this point. I know I can't eat or drink for hours beforehand. I know not to wear any jewelry to the appointment. I know where to check-in and exactly which months-old magazines will be available for me to browse while I wait. I remember. I swirled my paintbrush in a cup of water and watched it turn a murky shade of orange. The phone call took just a few minutes, and I've learned how to bounce right back into mommy mode, how to not skip a beat in my activities with Quinn, how to put on a brave face, even when my head is already starting to swirl with what-ifs. Quinn made a comment the other day about what it is each of us does: "Daddy goes to work, I go to school, and mommy goes to doctor's appointments! Right, mom?" Oh, buddy. I am so, so sorry. I've had a headache for nearly a week. It's probably hormonal, or it could be that one week into October and I'm already exhausted by the onslaught of awareness (although the conversation is starting to change!) It could also easily be because I have a terrible habit of grinding my teeth while I sleep. I wake up and my jaw muscles are sore from the tension I can't escape in the middle of the night. But I also know that somewhere around 50% of metastatic patients with Her-2+ breast cancer end up with brain metastases because chemo doesn't cross the blood-brain barrier and cancer cells do. I read this blog post by an oncologist the other day. He talked about an evening when he was sitting out with friends and watched a falcon descend upon a covey of quail, which he turns in to a metaphor for living with advanced cancer. He also writes about how "chronic" is not really an accurate descriptor, although it has been the one my doctors have used most with me. 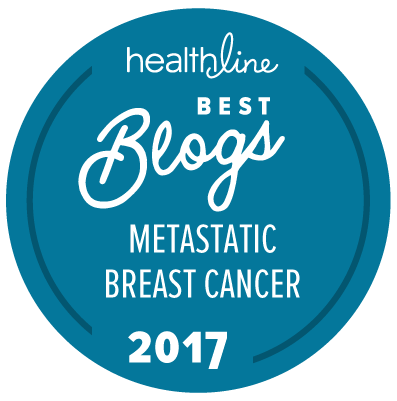 This line in the blog post hit home: "If you have metastatic breast cancer you are walking around under the cloud of a death sentence, any temporary stay of execution provided by fulvestrant or T-DM1 notwithstanding." T-DM1 is the drug I'm on. And so already, my scan a month away, my head swirls with the what-ifs -- how long will this temporary stay be? When will the next big scientific breakthrough happen, and will it be soon enough? Am I strong enough to face chemo-chemo again, if this drug stops working? Why does my head hurt so much? But I have learned to reel myself in, to go back to the moment, to keep painting. This last line from the oncologist's post also stuck with me: "And then, much more quietly than the quail and more slowly than he had arrived, the falcon took off, talons empty: not today. Not today. Not today!" My hospital also manages to call during activities with my son, no matter what time of the day. And they call from an unknown number, because they don´t want to reveal the doctors´ cell phone numbers. The hospital is the only one calling me from a hidden number. Mine always announces "Pinnacle Oncology" on-screen. I think they want to ensure I'll answer! Thanks for the good wishes. My scan's not even until November! I shouldn't be anxious this early. But I feel like if I tag it, put a name on it, write a little about it, then it loses some of its hold on me and I can calibrate my gauges again -- a little, anyway. What a horrible place it is knowing one day we will be plucked from the group of quails. I too am on TDM-1, due for scans, and having headaches. My head sensations include scalp tingling along the right side of my head. I keep hoping my symptoms are simply my sinuses reacting to some allergen in the air, and the MRI under consideration of my brain will not be necessary. I so hope scans will reveal that we have again escaped the falcon's talons. It is a scary place, but I just keep hoping that scientists will get better at ridding us of these falcons, and that I can ride the wave of their innovations into old, old age. Please keep me posted on your scans, okay? Thank you for such compassionate words. It is a fantastic mind-game, living with MBC. I hope they find a cure in my lifetime.